The two Stevens brothers, Robert L. and Edwin A. Stevens, owned a large tract of land south of the railroad which ran where Mickle Boulevard now is, which they laid out into building lots about 1840. Stevens Street, which was on their land, bears their name. 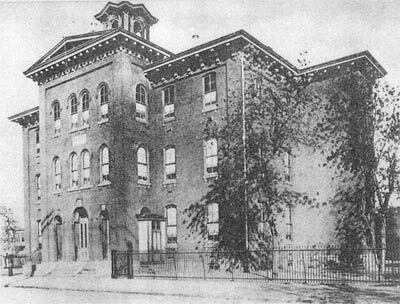 Edwin A. Stevens, who resided in Hoboken NJ, donated the lot on which the Stevens School stood on in 1866. 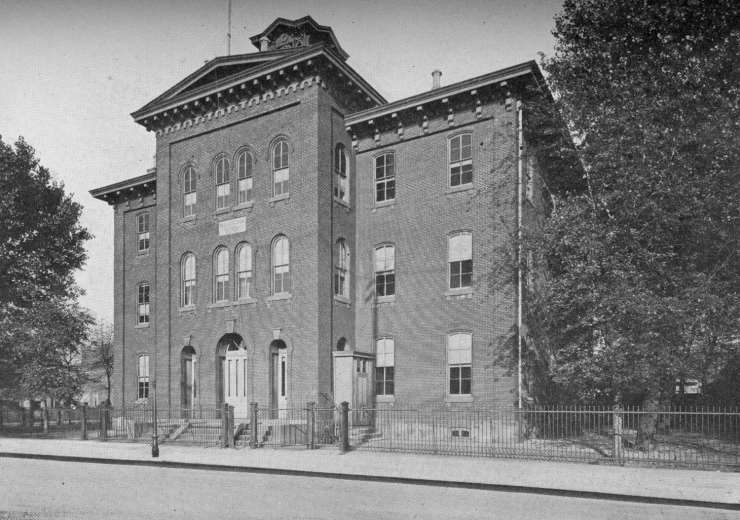 This lot was bounded by Washington Street to the north, Berkley Street, to the south, and Riley Street to the rear of the school, looking west. The donation of this property was Mr. Stevens' last act before embarking on a voyage to Europe, a trip which, sadly, he never returned. The school, the third school edifice built by the Camden Board of Education, was erected at 430 South 4th Street in 1867, and completed the following year. It was named in memory of the late Mr. Stevens. William B. Mulford was the contractor for the elegant building, which contained 15 rooms, including a General Book Depository (school library), a meeting room for the Board of Education, and classrooms. 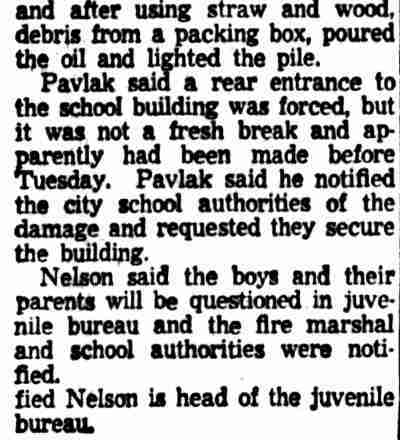 Mahlon Harden also played a role in the schools construction. Upon opening of the new school, W.L. Sayre was appointed principal of the boys’ department, and Hope Anthony to that of the girls. Minerva Stackhouse was first assistant principal from 1889 until 1900. 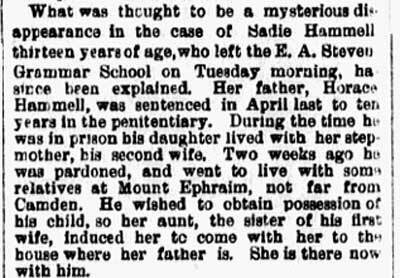 A notable student of the E.A. 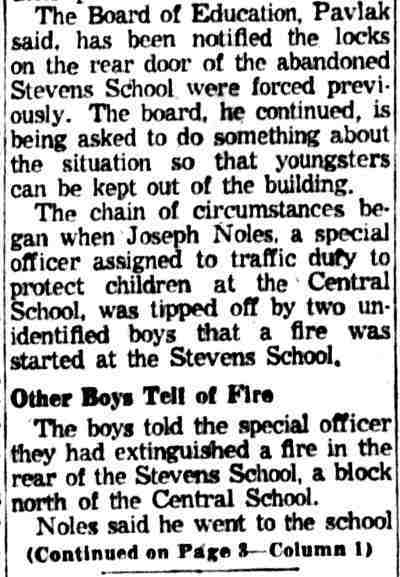 Stevens School was Colonel John Dibble, who was named Surgeon of the Third Army just after Pearl Harbor. Colonel Dibble was killed in a plane crash in the Pacific on February 7, 1943. Known in later times as the E.A. 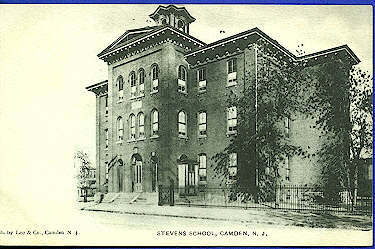 Stevens Grammar School, the building was still in use as late as 1947. 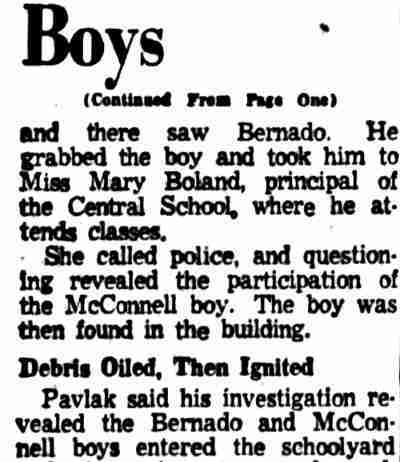 The school was closed after the 1953-1954 school year, and in short order was vandalized. Bids were taken in 1956 and a contract for demolition was awarded in August of that year. Two Camden boys were injured while at play in schoolyards during recess period yesterday. Edward Pacentino, 11 years old, 214 Stevens Street, suffered lacerations of the scalp when he fell from a fence at Stevens School, Fourth and Washington streets. "Realizing the utter futility of their efforts to elect David Baird to the governorship, the Republican party in Camden County is resorting to every contemptible means at its com­mand to intimidate the voters." This declaration was made last night by Miss Marie V. Kelly, former jury commissioner, at a meeting of 200 voters in the Fourth Ward Democratic Club, 455 Berkley Street. "At a meeting of election officers," Miss Kelly said, "William E. A. King, a member of the county board of elections sworn to preserve the sanctity of the ballot box, told these officers that the Republican party has promised Baird a 50,000 majority in Camden County and that they were to get the votes no matter how they got them and that they would be protected. He told them if the Democrats interfered that the Republican police would take care of the Democrats. 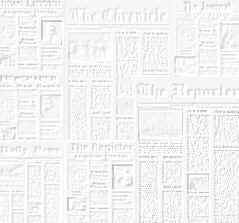 "Mr. Dickinson has evidently forgotten the murder committed at Third and Benson Streets on the eve of the city election in May by gunmen imported by the Republican workers to intimidate the voters of that ward- gunmen who remain uncaught and unpunished to this day. "However, school children are forced to use this building every day of the school year. The residence to which the polling place has been transferred was reconditioned so that it could be used. The real reason for this change was that it will be much easier to dispense liquid refreshment in a private home than in a public school. "It is a. fine state of affairs when the people are called on to build a $10,000,000 city hall within six blocks of a school where children are forced to occupy a school which the city clerk says is in a horrible condition and totally unfit for use. "I urge the people in the third and fourth wards of Camden to rise in revolt against the Republican organization that is trying by every means to prevent an honest exercise of the franchise at the polls on Tuesday. The protest must be registered by marking every blank on the ballot under the Democratic column". Miss Viola E. Batten, retiring assistant principal of Stevens School, this city, was the guest of honor at a luncheon given at the Woodbury Court Apartments, Woodbury. Miss Batten has been a member of the teaching staff of the Camden public school for 40 years, the last 26 of which she has spent at the Stevens School. Among guests at the affair were Mrs. Mary Ridgeway and Charles Furst, former principals of the school, and V, .N. Heffelfinger, present principal. The latter presented Miss Batten with a dinner ring, the gift of her associate teachers. The appointments to the city's educational staff announced by Samuel E. Fulton, president of the board of education, revealed last night that three former Camden High athletes are among the new appointees. The trio are Mitchell Mozelski, Edward Lobley and Edward "Pat" O'Brien. In addition to the appointment of the above, shifts in the physical education department for Camden's two senior high schools were also announced. Mozeleski, Lobley and O'Brien were stars of the first water while attending the local institution and also sparkled in college athletics. Mozeleski has been assigned to the physical education department at the Camden Academic High School at Farnham Park and will assist Phillip R. Brooks. Brooks and Mozeleski will coach the various sports at the academic institution, with the latter more than likely taking over football and track and the former basketball and baseball. Brooks, however, will be in charge of the physical department. Mozeleski comes back to his alma mater after having had wide success in college sports and in coaching. "Mitch" attended William and Mary College and captained the football and basketball teams in his senior year, while also earning a letter in track. Following graduation from the Virginia college, Mozeleski coached at a Virginia military academy. Mozeleski is well versed in football and is expected to turn out a formidable team this year at the academic institution. Still, he will have to find plenty of new material, as a number of the present gridders have transferred to the Woodrow Wilson Commercial High School, located at 32nd and Federal Streets. Grover "Worm" Wearshing, who assisted in the physical ed department at the local school during the past three years, and tutored the football and baseball teams, will take charge of that department and athletic teams at the Woodrow Wilson High School. As yet no assistant has been named for Wearshing, but within the next few weeks an announcement will be made by the board of education. Frank Sias, who was on the physical ed staff at the local high school and coached track, has been appointed as physical instructor at Cramer Junior High School and will be assisted by Mary Ladewig, another former Camden High grad, who has starred on the cinders for Temple University and Meadowbrook, holding a number of Middle Atlantic A. A. U. records. Lobley and O'Brien have been appointed as teachers in grammar schools. The former wlll teach at Fetters School, while the latter will tutor at Stevens School. Lobley, who was a three-letterman at Camden High, graduated from the University of Pennsylvania and was on the varsity basketball team for three successive years, captaining the five in his senior year when the Red and Blue won the Eastern Intercollegiate championship. O'Brien, who was a star center at Camden High on the eleven, is a graduate of St. Joseph's College, and performed for three years at that position for the Philadelphia institution. While both have been assigned as teachers, it is likely that they will build up a foundation of grammar school athletics, teaching the youngsters the fundamentals of various sports. Fulton also announced last night that in dividing the present enrollment at Camden High into two separate institutions, that both will have the required number of male students to enter the Group 4 division in athletics. Schedules are already being drawn up for football for teams at both the academic and commercial arts schools. Fulton also stated that in all likelihood the elevens of both schools will meet on Thanksgiving Day to decide the supremacy of the city public school football title. However, this cannot be decided upon definitely until the alumni agrees to abandon their regular Thanksgiving Day game with the senior high team. .
Department students at the E. A. Stevens School, Fourth and Washington Streets, have received awards for scholarship, attendance and athletic achievement. Presentations were made by V.M. Heffelfinger, school principal, during assembly exercises Monday. Yolanda Meloni, who maintained the highest average among the 7A classes, received a gold button. Others to receive gold buttons for "A" scholarship were Anna Cettei, Mary Marzella, Albert Vizarelli, Julia Salvatore, Helen Theodoris and Nicholas Tavani. Gold buttons also were awarded to the following students for maintaining "B" averages during the term: Yolanda Brighella, Jennie Giordano, Rose Procacci, Eva Di Bartolomeo, Nancy Iezzi, Dino Bernardi, Virginia DiOrio, Victoria Iacovelli, Phyllis Di Natale, Lilla Melchionni, Gloria Michilli, Josephine Palumbo, Eleanor Reino, Jean Caprarola and Theresa Burgo. John Mellno, Carmen Spino, John Bennie, Erasmo Angelastro, Stelio Bamonti, Stephen D' Agostino, Louise Patragnoni, Helen Vassalotti, Gema Di Filippo, Joseph Galasso, Yolanda Ognissanti, Michael Pilla, Joseph Carbone, Christine Priorella; Anthony Di Martino, Carolina Flamini, Mary Orsini, John Verderosa, Mary Di Mauro and Gilda Cianci. The official school letter was awarded to members. of the basket ball team Including Stephen D'Agostino, captain; Albert Spinelli, Anthony La Presti, Joseph Drogheo, Anthony Iaquinto, John Painchello and Albert Roberto. Heffelfinger also awarded honor able mention to 79 students who neither were absent nor tardy during the term. Liberty and H.B. Wilson will battle it out this afternoon at 2,30 0' clock at Convention Hall for the first-half title of the National Division of the Camden Grammar School League. Both teams finished the first half with six victories and one defeat. Liberty handed Wilson its lone reverse, while Stevens pulled an upset by downing the former. Some of the players from each school graduated during the past week, but, as they represented their schools all during the first half, they will be permitted to see action in the playoff. 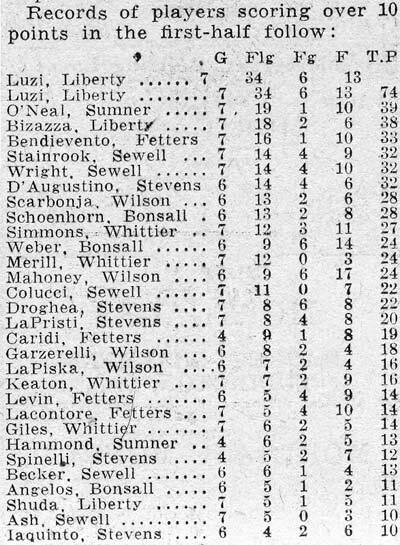 Liberty is led by Archie Luzi, diminutive sharpshooter, who led the league in scoring with 74 markers in seven games. He far outclassed the others as can be seen readily when the statistics show that his nearest rival, O'Neal of Sumner, took second place honors by scoring 39 points. Bizazzo, Shuda, Hare, Eulo and Luzi will probably start the game for Liberty. Wilson will use Garzarelli, Scarbonja, Ross, Mahoney, Lapiska and Kevis. museum of science and industry and museum of modern art at Radio City. In addition, Haber has made arrangements for the girls to view an NBC radio broadcast while in New York.